Finding Myself in Easter Island | Cheer Up! Posted on November 12, 2015	by Mimi G.
Imagine sitting on a rocky shore, listening to the crashing waves, pondering the enigma of the giant rock statues in front of you. This is Easter Island, and it is a weird place. I’ve never been here before, and it feels like I’ve reached my goal. It’s the first (and so far, only) time I’ve felt like this in a peripatetic life. Sure, I like to sport a t-shirt saying, “Not all who wander are lost – J.R.R. Tolkien”, but the truth is, like most other people, I feel lost most of the time. My endless craving for adventure carries me through cramped flights and travelers’ diarrhea, and I am ready to brave the discomforts of the road for the enormous reward of encountering the unknown, but I would scarcely call it “coming home”. Until now. 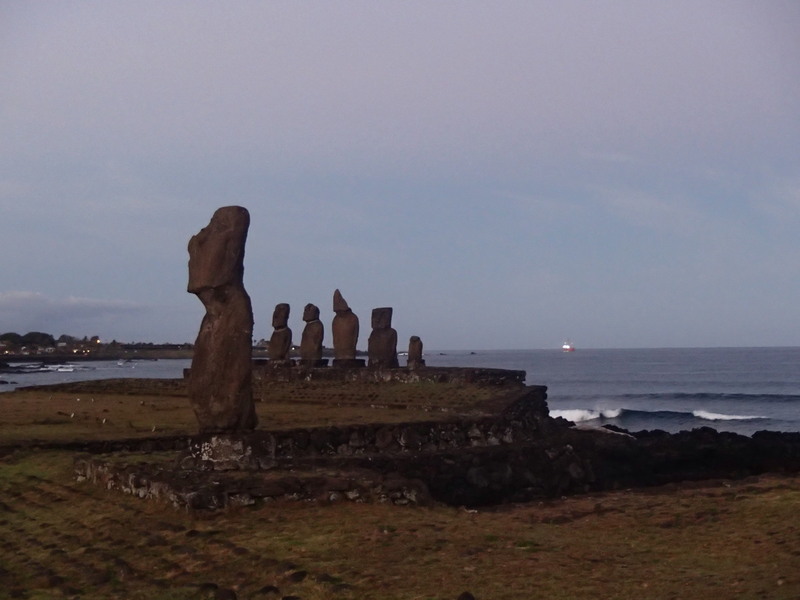 In this post-technology world, from Paris to Beijing, you can engage in a fruitless quest to find a place far from the shadow of the golden arches of McDonald’s (and perhaps even to find yourself there) — until you hit upon Easter Island. 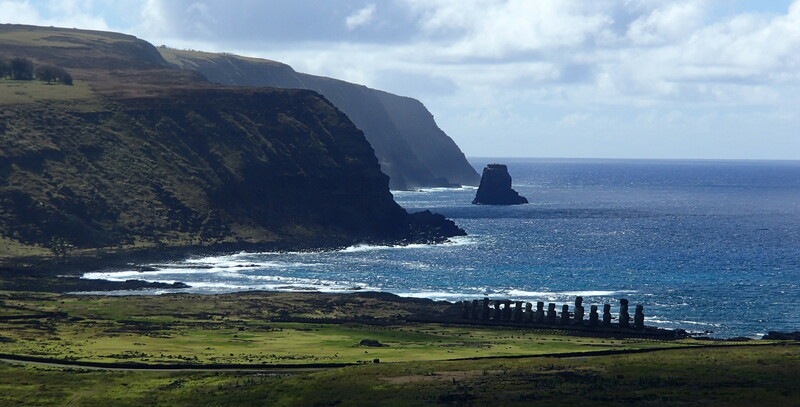 Just a tiny speck in the Pacific halfway between Australia and Chile, Rapa Nui (as it is called in the local dialect) is the most remote inhabited landmass on earth. Easter Island feels very natural. Not “fake natural”, like people changing their jeans for tree-bark skirts because that’s what tourists want to see. Natural, like birds in a forest or trash in a city. I think that’s because it’s really hard to get to. First, you have to fly to Santiago, Chile from wherever you are, and then take another six hour flight there. It hardly seems worth the effort. Unless, of course, you are building a mental collection of the most unusual places in this world, in which case, Easter Island will be the gem of that collection. There is some tourist infrastructure there, but nothing that jars. There is one mega-luxury resort (much bitterness exists among the locals about how the land was obtained by the developers, resulting in some protests). There are a couple of well-maintained campgrounds, and some middle-of-the-road guest-houses, that are clean and very nice, as long as you don’t mind getting woken up before dawn by the roosters. There’s a surf shop and a few low-key restaurants, serving up good food. There’s a place to rent scooters to zip around the island (the best way of getting around), but watch out for the stray dogs who will think it a game to run right in front of the scooters! There are many wild horses, some of which have been domesticated enough to offer you a ride. There is a rocky coastline, almost no trees, and waves bigger than any you’ve seen elsewhere. Most of all, there is a sense of the miles of emptiness all around you. The island is known, of course, for its Moai statues. What do they mean? Why did the Rapa Nuians put all the effort into making hundreds of these statues? Did they worship them?How did they transport them to where they stand? A popular misconception is that all the trees on Easter Island were cut down to make log rollers for this transport, but actually, all the trees were cut down to create room for agriculture. Whereupon, the thin top soil promptly blew away, and neither crops nor trees could grow on the island. (A few palm trees have recently been transplanted, I suspect at an enormous cost, from French Polynesia.) Which still begs the question, asked by Jared Diamond in “Collapse” — what was the person cutting down the very last tree thinking? It is very likely that we shall never know. The original inhabitants have long died out, and they left behind no written records. Easter Island is a destination that will reward you with more questions than answers, a place for those who find joy (and themselves) in questions. 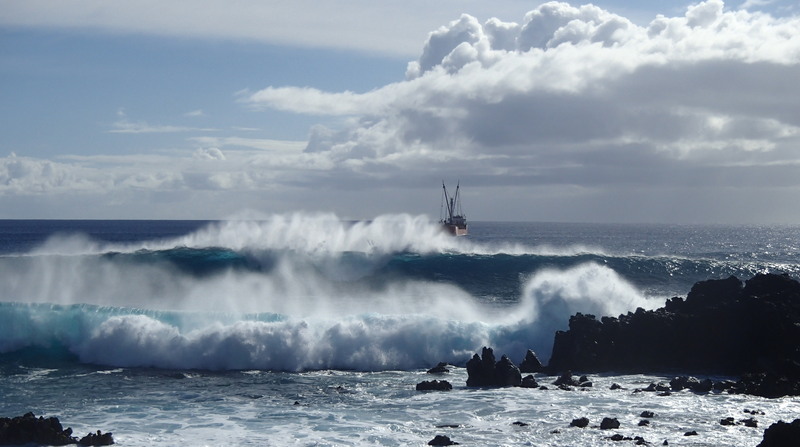 This entry was posted in Travel and tagged Easter Island, Island, Moai, Pacific, Traveltherapy. Bookmark the permalink. Going there next month. This is a wonderful buildup. Superb piece! Thank you. I know you will have a wonderful time there! Liked the play on words: “finding yourself”. I honestly don’t know what it was about Easter Island that led to the “finding myself” feeling. All I know is, before this trip, every place I went, I would just want to keep going to yet another place, like a mad scrabble to see every bit of the world before a timer expired. When I went to Easter Island, I had the distinct feeling that I finally reached my goal. I still love traveling, of course, but every new place feels like a bonus now, as if the universe is gifting me more than I hoped for. You talk of “inspiration for seeking happiness” but if there were ever a recipe for finding happiness, it is this: to get yourself into a place where every good thing that happens to you, you feel like it is a gift from the universe! That is truly inspiring. One thing I like about Indian culture is the deeply ingrained belief that life is expected to be a mixture of happiness and sorrow, that problems are an integral and indispensable part of the human experience. Even Gods are depicted as having their share of conflicts and problems, not to mention negative quaities – a very different concept of heaven than perfection.